Studies have shown that taking certain minerals and vitamins for memory can have a beneficial effect on the brain, just as micronutrients generally will improve the health if they are taken in the correct quantity. Deficiency in some vitamins can cause memory loss, whether caused by illness, aging, alcohol or drug abuse, medications or simply poor diet. The B group of vitamins is important for brain function, but any excess of these vitamins is excreted rather than stored in the body. B1 (Thiamine) found in whole grains, most vegetables, yeast and pork, is important for brain and memory function. Elderly people and alcoholics often have very low levels of thiamine, and prolonged low levels can lead to the syndrome called Wernicke-Korsakoff, which causes irreversible brain damage. B12 in particular is one of the more vital vitamins for memory function. Needed for the production of red blood cells, B12 is found in pork, beef, offal, dairy and eggs and the diet of vegetarians and vegans may therefore be deficient in B12. Symptoms of B12 deficiency, including pernicious anemia and memory failure, may take up to five years to appear after the body's reserves are depleted. B12 is not easily absorbed through the stomach wall, and older people are often found to be deficient in it. Vitamin E, or Tocopherol, is associated with reducing the effects of aging by acting as an antioxidant and slowing down cellular aging. It also helps brain function and may aid memory through acting as a vasodilator and improving blood circulation to the brain. Vitamin C, or ascorbic acid, also retards the aging process by acting as an anti-oxidant and helps cells hold together. Omega 3, an essential fatty acid found in oily fish and some nuts is known to maintain a healthy heart and circulation in those who eat it regularly, but also plays a part in keeping the brain and memory function healthy. Is Omega 3 a Memory Pill? Researchers have also studied the effects of using natural herbs as well as vitamins for memory improvement, including rosemary, which was found to improve memory function in young people in a recent study presented at the British Psychological Society. The subjects were tested in cubicles scented with rosemary, lavender or no scent, and rosemary seemed to produce the best memory function. 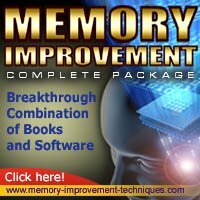 Other supplements that may have an improving effect on the memory include Coenzyme Q10, Huperzine A, Phosphatidylserine, L-Glutamine and 2-Dimethylaminoethanol. However, it is inadvisable to take supplements without first consulting your physician.